Android O re-architects the Android OS to define clear interfaces between the device-independent Android platform and device- and vendor-specific code. Android already defines many such interfaces in the form of HAL interfaces, defined as C headers in hardware/libhardware. 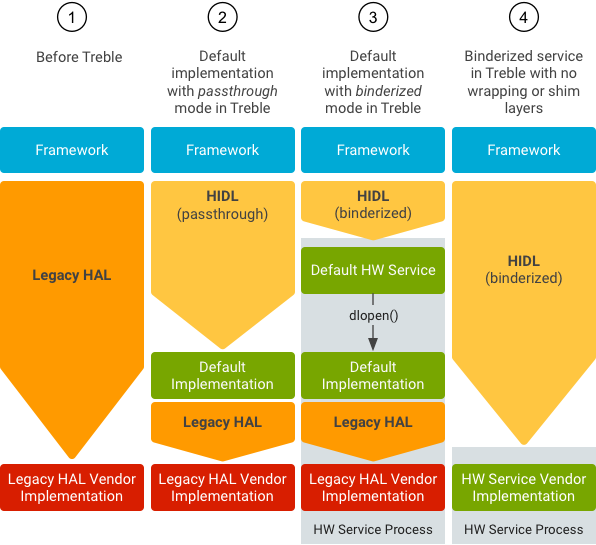 HIDL replaces these HAL interfaces with stable, versioned interfaces, which can be client- and server-side HIDL interfaces in C++ (described below) or Java. The pages in this section describe C++ implementations of HIDL interfaces, including details about the files auto-generated from the HIDL .hal files by the hidl-gen compiler, how these files are packaged, and how to integrate these files with the C++ code that uses them. A client of a HIDL interface is the code that uses the interface by calling methods on it. A server is an implementation of a HIDL interface that receives calls from clients and returns results (if necessary). Figure 1. Development progression for legacy HALs. To create the HAL implementation, you must have the .hal files that represent your HAL and have already generated makefiles for your HAL using -Lmakefile or -Landroidbp on hidl-gen (./hardware/interfaces/update-makefiles.sh does this for internal HAL files and is a good reference). When transferring over HALs from libhardware, you can do a lot of this work easily using c2hal. For the HAL to work in passthrough mode (for legacy devices), you must have the function HIDL_FETCH_IModuleName residing in /(system|vendor|...)/lib(64)?/hw/android.hardware.package@3.0-impl($OPTIONAL_IDENTIFIER).so where $OPTIONAL_IDENTIFIER is a string identifying the passthrough implementation. The passthrough mode requirements are met automatically by the above commands, which also create the android.hardware.nfc@1.0-impl target, but any extension can be used. For instance android.hardware.nfc@1.0-impl-foo uses -foo to differentiate itself. // size one because of this call. // would have to specify 'false' to willJoin in configureRpcThreadpool. This daemon usually lives in $PACKAGE + "-service-suffix" (for example, android.hardware.nfc@1.0-service), but it could be anywhere. The sepolicy for a specific class of HALs is the attribute hal_<module> (for instance, hal_nfc). This attribute must be applied to the daemon that runs a particular HAL (if the same process serves multiple HALs, multiple attributes can be applied to it).